I’ve made more progress on the basement studio! I picked up another Expedit (I call them my “cubes”), and a couple of freestanding kitchen counters from IKEA’s Värde line. I’ve always wanted the one with all of the drawers, so I’m glad that I finally have space for it. 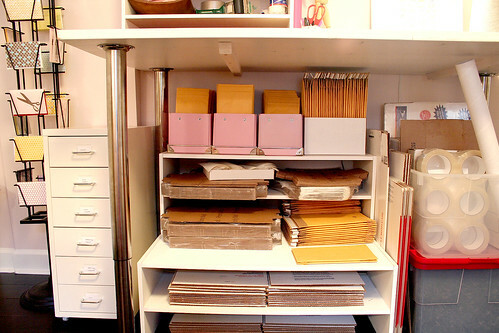 All of my supplies will go in the drawers, and my products will be lined up on the shelving. Yeah, I have just a wee bit of work to do there. I’m glad to have closed storage now though — that will go a long way in making it look more neat. The main layout is setup and the big furniture pieces are in place, so I’m going to have to get down there and start organizing. I’m wondering about the windows now. I love playing with color and pattern in window curtains, but the basement windows don’t really call for window treatments. There is a surprising amount of natural light in the basement, and I want to preserve as much of that light as possible. So no curtains? Or yes, but with them mounted extra wide and open all the way? The windows are high and short too, so that may be another reason to eschew treatments. I can’t wait to see the final product of your basement. Everything is turning out so great! Nice progress! I have a VARDE in my kitchen and it has really held up over the years. I don’t think you need window treatments, because I’m sure you’ll find a way to bring color/texture/pattern in via other ways. It must feel so good to make some progress, it is looking goooood! You are famous for patterned window treatments. I think you can still have them, but with shades instead. 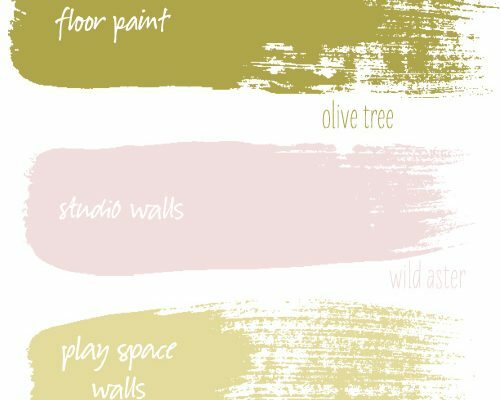 There are so many patterned shades out now, and of course you can DIY one. I think it would be neat to see a band of pattern above the window, like 4″ or so, when the shade is barely drawn. I can’t wait to see the final product. It looks like it’s coming along quite well! I would do a simple window treatment. Either a valance or a curtain mounted wider than the window make it appear larger. Then you could leave them open all the time and still get your natural light. What a fun studio space! And I definitely see some sort of fun window treatment! I like the idea of a whimsical valence, mounted high and just gracing the window trim or short panels with grommets hanging wide. The bold rug and bright floor need some friends. With your eye, something wonderful will come together! I just purchased the round Dokstra table and black and white rug for my office as well, great minds I guess! In terms of the windows, I like the idea of curtains but set high and wide so the whole window is exposed. It would also look great if you did a painted wood panel detail under the window to make it look larger. I really like the Varde, super smart idea. 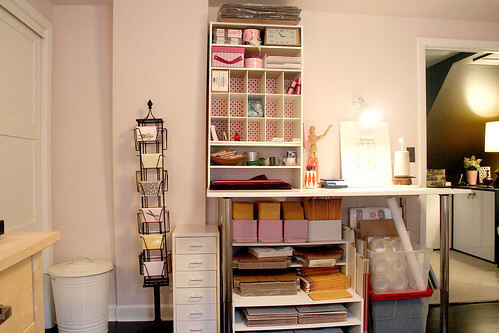 I think your last shipping space was so clean and neat, but so are you:) I am so envious, I want a basement office now! could you paint something whimsical or ‘floating’ around the windows, to bring some dimension and attention to the area, without covering them? i was just thinking some freeform design kind of ‘floating’ from the windows, just for a little za. The room looks great! The colors, organization and rugs look awesome! House plants! No curtains. Loooooking good! High and wide is what I would do with the windows. No, maybe one large piece hung high and then pulled back to one side- that might look nice without being too much on those little windows. Whatever you decide I’m sure it will look fabulous! Can’t wait to see it. No need for curtains, but maybe a little bunting hung about them in some way? I love the new studio. 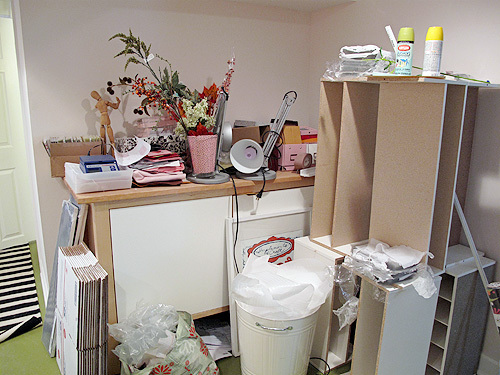 My own little office/studio/craft room is bursting at the seams, but I have the ‘cubes’ too – and they help – a lot! You could put a valance higher than the window, creating the appearance of a traditional window size. I love this!!! The pink accents in the shipping center are my favorite! Forget the window treatments, get some awesome, low maintenance plants and of course some awesome pots for them and call it a day! What about adding pattern and texture with fabric wrapped canvases instead of curtains. AWESOME! That is really coming along. I wish I had a basement! Where did you get those beautiful striped rugs??! Love it! I vote curtains; mounted high and wide and just skimming the cabinet top. Sweet! You know, if you don’t need curtains for privacy I think you would be fine with leaving them as-is. It is a lovely bright space. It looks fabulous! You are inspiring me to move the basement renovation up my “to do” list! I am so glad to see that you’re not having the same flooding issues everyone else in O.P. is having! Your studio looks very nice and organized! I´m sure it will be a nice space for you to work in! I have the same rug, and it needs to be clean. Have you ever clean your? Have a tip or method for cleaning?? Oh my! Your home IS lovely! Thank you for sharing! It’s breathtaking!